For over a century Black and Decker has been providing its customers with quality DIY equipment. From drills and hedge trimmers through to chainsaws, they are known for their quality and reliable products. Black and Decker first began in 1910, and from humble beginnings it became known as one of the best manufacturers of DIY products. Its own power head was even used to drill for core samples on the moon! Many people vouch for this quality brand and manufacturer, and it can be found in many stores across the world. Black and Decker offer a range of chainsaw models to meet many different markets. From the homeowner in need of electric, to the arborist looking for a pole saw, and a lifestyle block owner hungry for a petrol powered machine; they offer it all. All of their chainsaws are also backed by warranties, giving owners peace of mind. Not only do their models aim to be affordable on the market too, but there are also plenty of replacement parts for sale both online and in store in case of wear and tear. 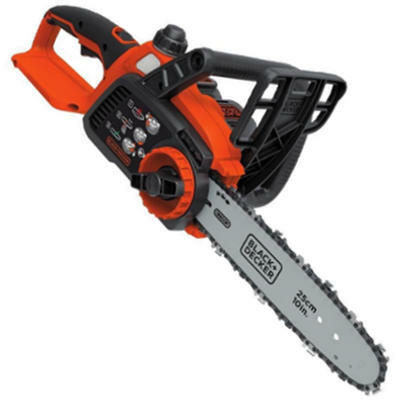 It’s powerful in comparison to other electric chainsaws with similar specs. Its bar and chain is designed for reduced kickback. It’s quite heavy to operate. The automatic oiler doesn’t always deliver enough oil to the chain. It can leak oil when not in use. Black and Decker electric powered chainsaw. Dimensions: 9.63 x 8.81 x 28.56 inches. QHow many cuts can be made on a single battery charge? AAround 60 4×4 pine lumber cuts. AA 40V MAX 2.0Ah battery. QIs the battery interchangeable with other Black and Decker products? QDoes it come with oil? For the cost, this Black and Decker electric chainsaw offers a lot of exciting features. It has top rated power levels and performance for both dry and wet wood, as well as being perfect for completing home maintenance with ease. The battery takes approximately three hours to charge, and once charged can complete up to 60 4×4 pine lumber cuts. For a homeowner, it’s the perfect addition to the tool shed. Check out what other people who purchased this product think about it. 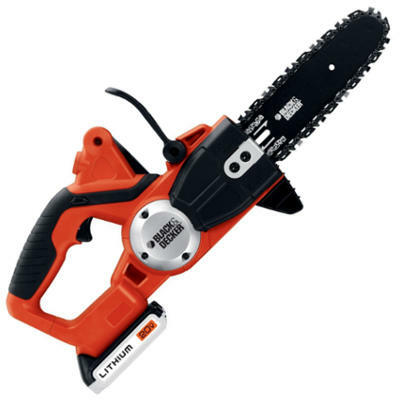 Read Black and Decker LCS1240 cordless electric chainsaw reviews. It’s powerful enough for what it’s designed for. Many users note the auto-oiler does not work. Dimensions: 9.63 x 8.81 x 16.7 inches. There seems to be a large manufacturing issue with the auto-oiler which has caused this product to not be as effective as it can be. However, if you put that issue aside, this Black and Decker 10 inch chainsaw is the perfect addition to a homeowner’s tool shed. It’s reliable, it’s powerful, and it’s very easily to purchase both online and instore. Parts also have a small price tag. 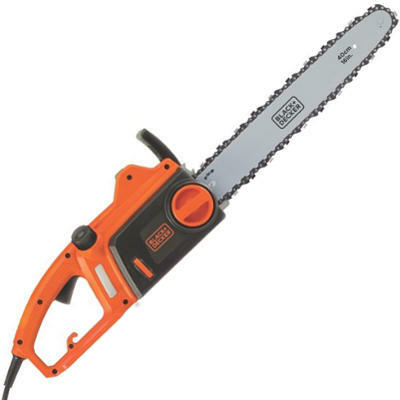 To get the best deal, you are best to purchase this chainsaw online. Check out what other people who purchased this product think about it. Read Black and Decker LCS1020 cordless electric chainsaw reviews. It has an automatic oiling system for user convenience. For the price, it’s very powerful and reliable. It’s limited in its reach by the length of the power cord you attach. It’s quite heavy and cumbersome to operate. QWhat size file do you need to sharpen the chain? QHow many amps does it draw? QWhat kind of extension cord is needed? AA heavy duty outdoor use extension cord. If you require outside chores completed that are a little above standard backyard cutting, this is the saw for you. Priced to be affordable and competitive on the market, the 18 inch bar and chain coupled with the powerful engine make for the best deal. Users can expect little to no maintenance, a clean cut and effortless use. It also comes with a 3 year warranty for peace of mind. Check out what other people who purchased this product think about it. Read Black and Decker CS1518 corded electric chainsaw reviews. It’s well priced in comparison to other brands and models of similar specs. It starts easily compared to gas powered models. The chain tensioning system doesn’t seem to work well. Dimensions: 19 x 9 x 12 inches. QWhat replacement chain can be purchased for this saw? QDoes it require assembly before use? QWhat kind of work is it good for? Several buying guides and online reviews have sung this electric chainsaw’s praises, and it’s easy to see why. Not only is it lightweight, easy to use and reliable, but it also has a lot of power on offer for what it’s designed to do. 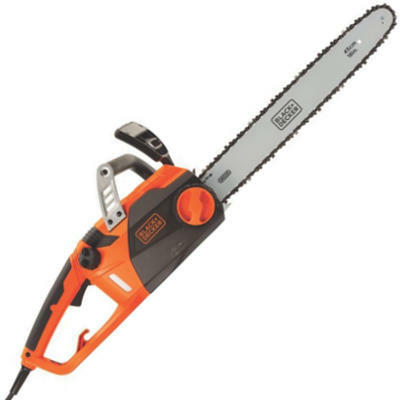 For light pruning and trimming, this chainsaw undertakes the tasks with ease. It also has great safety features and easy-to-remove components to undertake maintenance. Overall, this electric chainsaw is one of the best Black and Decker chainsaws for the money. Check out what other people who purchased this product think about it. Read Black and Decker CS1216 corded electric chainsaw reviews. The battery is compatible in a range of Black and Decker tools. It comes with the battery and charger. It’s a perfect saw for a homeowner undertaking light maintenance. It’s very comfortable to use. It’s exceptionally lightweight, especially in comparison to other manufacturers, models and brands of similar specs. Its limited in its use by the battery life. The bar and chain length limits its abilities. Dimensions: 10.94 x 7.5 x 14.81 inches. QWhat is its cutting capacity? AApproximately 1-½ inches in diameter. It’s the little saw that keeps on giving. Black and Decker really pulled one out of the bag when it came to the creation of this 8 inch battery powered powerhouse. The battery is long-lasting and can make 150 average cuts on one charge. It also has great safety features which make operation easier and safer for the less experienced. It’s extremely affordable on the market, powerful, lightweight, and suits many homeowners down to a tee. Check out what other people who purchased this product think about it. Read Black and Decker LCS120 cordless electric chainsaw reviews. It has an overhead reach of up to 14 feet. It can make up to 100 cuts on one battery charge. It’s lightweight for easier management. The pole extends to 6 ½ or 10 feet. The chain can ‘jump’ off. Some users note some components are poorly made. Black and Decker battery powered pole chainsaw. Two year warranty for both the tool and the battery + charger. Dimensions: 44.5 x 8.13 x 8.25 inches. QIs it suitable for cutting metal or other materials? AYes. as long as it’s 20V. QCan it be used without the pole? For the professional arborist in need of a second tool, or the homeowner with a lot of topping to do – this is the tool for the job. It’s lightweight, has a long-lasting battery and has a lot of power for its size. It’s also easy to manage on the pole and can cut up to six inches in diameter. You can also receive the best deal in price online, or why not head instore and see what’s available? 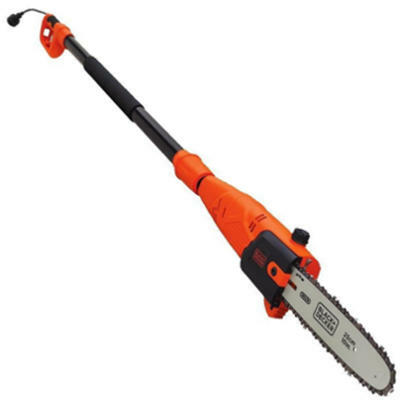 This pole saw is undoubtedly one of the best Black and Decker chainsaws for the money. It has a powerful engine for those larger cuts. It’s self-oiling whereas many other pole chainsaw brands aren’t. It has a 10 inch bar and chain whereas many other pole chainsaw brands have 6-8 inch chains. It has a 9.5 inch extended pole. Some users find it heavy to use for extended periods of time. The chain is difficult to put on. The chain is known to fall off even after recent tightening. Dimensions: 68.3 x 3.8 x 6.4 inches. QDoes it detach from the pole? QDoes it adjust the chain tension automatically like other pole saws? ANo, it requires manual chain tensioning. QCan the saw head rotate for angle cutting? This pole chainsaw will easily become an arborist’s best friend. It’s very lightweight, easy to use, requires minimal maintenance and has incredible levels of power. It’s also packed full of features such as its low kickback bar and chain, increased cutting speed and reduced vibrations. Black and Decker have done everything they could to ensure this pole saw is reliable and practical for both homeowners and professionals. It could easily be considered a commercial grade saw and is one of the best Black and Decker chainsaws for the money. Check out what other people who purchased this product think about it. 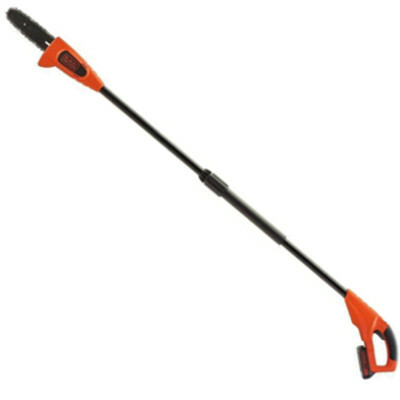 Read Black and Decker PP610 electric pole chainsaw reviews. It has a powerful 4.5 amp motor. It has a 4 inch cutting capacity which is ample for many homeowners. The bar and chain is really heavy duty. For the size of the product, it’s deceivingly heavy. It’s limited in its reach by its cord. The design of the guard allows too much bark to get clogged up. Automatic tensioner can fail to stop the chain from becoming loose. Black and Decker electric powered lopper chainsaw. 6 inch bar and chain. QWhat extension cord can be used? A50-100 feet with 16 gauge wire. QWhat is the best oil to use? If you’re not an experienced chainsaw user or you’re just after something a bit smaller, this lopper is for you. It has innovative clamping jaws which effectively and easily cut in one motion. It also has a heavy duty cutting bar and chain which can tackle thick suburban tree branches with ease. It’s easy to start, operate and maintain, and overall it’s an affordable product with a wide target market. Check out what other people who purchased this product think about it. Read Black and Decker LP1000 electric alligator lopper reviews. Replacement parts for the full range of Black and Decker products are easily found. All parts are very affordable, and can be purchased online on websites such as Amazon, or from any store selling Black and Decker products. All replacement parts will have model numbers reflecting the products they fit. You can often get the best deal by buying in bulk as well. Every chainsaw, at some stage, will need its bar replaced – whether it’s through general wear and tear or damage. For some brands it can be difficult to find quality replacements. Not with Black and Decker. Black and Decker produce a full range of chainsaw bars for every model they produce. This includes bars from 8 inches all the way through to 16 inches and drive links from 34 through to 56. These bars can be purchased both online and through reputable suppliers of Black and Decker products. If you are looking specifically for Black and Decker bar, check out this comprehensive guide about available Black and Decker chainsaw bars. However, if you’re looking for a bar in general regardless of the brand, you would love to read this full buying guide on how to select the best chainsaw bar for the money including reviews & comparison. Whether your chain has broken or it’s worn out, you are sure to find the replacement Black and Decker chain you are looking for. Most chains are easy to find on websites such as Amazon. You should have your model number handy in order to find the correct chain. All Black and Decker chains are affordable and can come as single chains, or in packs of two. When shipping costs apply, sometimes it can be more cost effective to buy them in the larger packs. If you are looking specifically for Black and Decker chain, check out this comprehensive guide about available Black and Decker chainsaw chains. However, if you’re looking for a chain in general regardless of the brand, you would love to read this full buying guide on how to select the best chainsaw chain for the money including reviews & comparison. Who makes Black and Decker chainsaws? Stanley Black and Decker (the merger between Stanley and Black and Decker). Where are Black and Decker chainsaws made? Where do you buy Black and Decker chainsaws? You can buy Black and Decker chainsaws both online on websites such as Amazon, and in stores around the world. The best deals can be found online.